YANGON, Myanmar (CNN) -- The trial of Aung San Suu Kyi has been postponed until Friday, while the country's military junta once again justified -- albeit indirectly -- its detention of the opposition leader. Without mentioning Suu Kyi by name, a full-page article in the New Light of Myanmar newspaper on Saturday laid out the penalty for someone running afoul of the state's subversion laws -- under which the pro-democracy advocate is being tried. "The restrictions can be extended up to a total of five years with the prior approval of the government in accordance with the law," the article said. 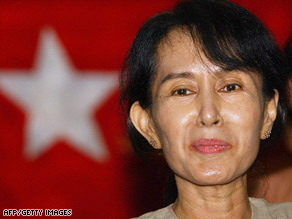 Suu Kyi's movement is already restricted: she is under house arrest. The explanation implies that if convicted, she could be confined for five more years. The junta says Suu Kyi violated her house arrest when she offered temporary shelter to an American man, John William Yettaw, who swam to her lakeside home. Her supporters say the move is meant to keep her confined so she cannot participate in the general elections that the junta has scheduled for next year. In recent days, international calls for Suu Kyi's release has grown increasingly louder, as her trial continues at the Insean Prison compound near Yangon. In response, the junta has been trying to make the case that it was within its rights to detain Suu Kyi. "As Aung San Suu Kyi is the daughter of Gen. Aung San, the leader of our country, we were deeply thinking whether to extend her detention or not," Myint Thein said. "Unfortunately, a U.S. citizen entered her house for two days. She allowed and made conversation with him, gave him food." "These kind of actions broke the law," he added. "This is why we have no way but to open a case. And we are very sad about this case." The newspaper piece on Saturday was an indirect reiteration of the same claim. The piece, entitled "Laws enacted for state stability and community peace," begins by saying every country -- including the United States and the United Kingdom -- has put in place laws that "if necessary to prioritize with national security interest, civil liberties of a citizen may be restricted." "Every citizen is to understand the fact that the government's promulgating the laws and taking action against offenders in accordance with the law are not associated with any forms of discrimination against or in favor of particular persons, nut just in the interests of the nation and the people," the article said. The trial adjourned for the weekend on Friday after the court heard from the lone defense witness in the case. The judge had asked both the prosecution and the defense to submit their summarized arguments by Monday. Over the weekend, Suu Kyi's National League for Democracy party was informed the trial will resume Friday.